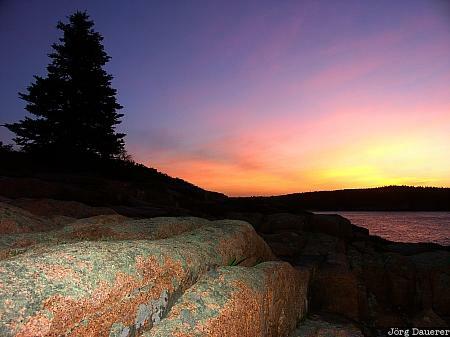 A colorful sunrise is illuminating the sky over the coast of Acadia National Park while the granite of Otter Cliffs is partially illuminated by a flash gun (used as a fill flash). Acadia National Park is in the northern part of Maine in New England in the north east of the United States. This photo was taken in the morning of a cloudy day in June of 2004. This photo is part of the exhibition Fill Flash (June 2016). This photo was taken with a digital camera.